Will the ‘Real’ Khan Please Stand Up? No more candy-floss, the 'real' Khan is here! We’ve swooned over Shah Rukh Khan (SRK) the star, we’ve admired SRK the actor, but rarely do we see the ‘real’ SRK on screen. From the simpleton in Kabhie Haan Kabhie Naa, the anti-hero in Baazigar, to the superstar in Om Shanti Om, SRK is often accused of stereotyping himself with too much of…er…himself. His style, his mannerisms, his dialogues, his stance, his gait, everything about SRK reminds us of SRK, film, after film, after film. This stereotyping works in his favour conferring him worldwide adulation and titles such as King Khan, Baadshah and Superstar. Likewise, it isn’t rare to witness SRK’s acting prowess and love for the ‘method’ in many a film such as Chak De India!, Swades, and Devdas to name a few. Amidst all this mêlée, the real Khan was lost giving engrossing TV interviews, playing charming quiz show host, buying cricket teams, and making brazenly honest statements that blow-up in to controversies. And as if to mirror the soul of this real-life Khan, Karan Johar (K-Jo) creates SRK’s alter ego on screen — Rizwan Khan — pompously titling his creation My Name Is Khan. Rightly so? One cannot help but wonder about the subtle yet stark similarities the character of protagonist Rizwan Khan shares with SRK’s off-screen persona. 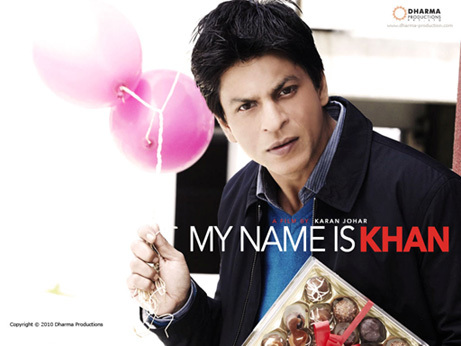 Like SRK, Rizwan too marries a Hindu (Mandira, played by Kajol); simultaneously charms and repels people with his honesty and straightforwardness; believes and practices secular humanism; quotes his mom at the drop of a hat; is misinterpreted and misunderstood; and has a message for the world that not all Khans (read Muslims) are terrorists. While some of these comparisons are based on observations about SRK’s nature, making it debatable if Rizwan really is SRK’s second-self, one can hardly deny that SRK leaves no stone unturned in portraying the role of Aspergers (a mild form of autism) afflicted Rizwan with subtlety, conviction and sincerity that immediately reflects on screen, making us believe that maybe “THIS is the real SRK“. SRK’s convincing performance would not have been possible without the similarly earnest approach of director-buddy Karan Johar. K-Jo perfectly fuses his trademark melodramatic and emotional elements with the global theme of terrorism. Unlike K-Jo’s previous debacle Kurbaan (read the review), which desperately tried to woo both the serious cinema-buff and the average movie-goer, MNIK successfully satisfies both these different sections of the audiences. There’s enough melodrama, tears and emotions for those who love K-Jo for bringing in family audiences, while people looking for a larger message and meaningful cinema wouldn’t complain either. Cleverly employing plots and subplots, K-Jo seamlessly blends the story of Rizwan in to a treatise on humanity, rarely slowing down the narrative’s pace. The tone is serious and the message is clear: terrorism exists but discrimination or hatred, of any kind, on the grounds of religion is unfair and the only solution is love and compassion for all. Evidently, credit for this also goes to writers Shibani Bathija and Niranjan Iyenger (Dialogues) for whipping-up an ingenious script that packs so much ‘stuff’ in to one film without losing track or going off-tangent. Credibly strengthened by yet another spontaneous and emotionally charged performance by Kajol, the script presents her with enough scope to revisit her chemistry with SRK which has now overgrown its mushy-naughtiness in to a more mature-naughtiness. To this Kajol does complete justice. Yet another noteworthy mention is Zarina Wahab’s brief, yet spirited performance as Rizwan’s mother. While all this is ably supported by Shankar-Ehsaan-Loy’s soulful compositions that beautifully blend in to the movie’s overall scheme of things. Like any other flick, MNIK too has its weak areas. Yes! SRK does fumble. There are scenes where he is flawless and then there are those where he seems inconsistently out-of-character. For a moment, it feels like Rizwan does not have Aspergers. But these are few and far between and I bet you would barely notice it had you not read this review. K-Jo too could do with some lessons in subtlety. His message is loud, but so is the melodrama. Emotions fly high, the human spirit reigns and things do tend to drag towards the climax (be ready with your tissues) and we could do with some crisp editing here but then this is classic K-Jo film-making. If you don’t like tears, steer clear. Or at least grin through the last 40-minutes with cheer. Overall, MNIK belongs to The Performance of SRK who underplays his role with restraint, thoroughly exploring his potential with mannerisms such as repeating words, employing a peculiarly hunched walk, and staring at people stoically as if unaffected by the turbulence around him. In more ways than one, MNIK is a coming-of-age film for both SRK and K-Jo. Whether SRK will prefer to retain his superstar status or break free from his self-inflicted ‘image’ to evolve into a finer actor than he already is, is uncertain. But one can always hope that given an opportunity (read good scripts) the ‘real’ Khan will stand up and give us what he is best at: entertainment with huge doses of original heart-warming performances. Tags: Asperger's Syndrome, Aspergers, K-Jo, Kajol, Karan Johar, MNIK review, My Name Is Khan, Rizwan Khan, Shah Rukh Khan, SRK. Bookmark the permalink.